"I am delighted to co-host the Santa Project Party & Auction with Tamsen Fadal ... UCP of NYC reaches thousands of families and individuals with disabilities throughout New York City. I am continually impressed by the scope and magnitude of their programs and ability to positively impact people's lives." ~~ Camilla Barungi , Co-host of The 4th Annual UCP of NYC Santa Project Party & Auction benefiting United Cerebral Palsy of New York City , Entrepreneur/ activist/ model of “Project Runway." "I am thrilled to co-host the 4th annual UCP of NYC Santa Project Party with its long time host Camilla Barungi ... I am a big supporter of UCP of NYC and their ongoing work to provide programs and services for children, families, and adults with disabilities." ~~ Tamsen Fadal , Co-host of The 4th Annual UCP of NYC Santa Project Party & Auction benefiting United Cerebral Palsy of New York City , Emmy-winning anchor of PIX 11 News. Tis' the season to celebrate, give, and be merry as co-hosts Tamsen Fadal, Emmy-winning anchor of PIX 11 News and Camilla Barungi entrepreneur/activist/model of “Project Runway” join together to help children and families during the Holiday Season and welcome all at The 4th Annual UCP of NYC Santa Project Party & Auction. The 4th Annual UCP of NYC Santa Project Party& Auction benefiting United Cerebral Palsy of New York City is being held at the hot new Bocca di Bacco in Chelsea on Tuesday, December 3rd. Facebook photos up and running on The 4th Annual UCP of NYC Santa Project Party and Auction Facebook photo album. 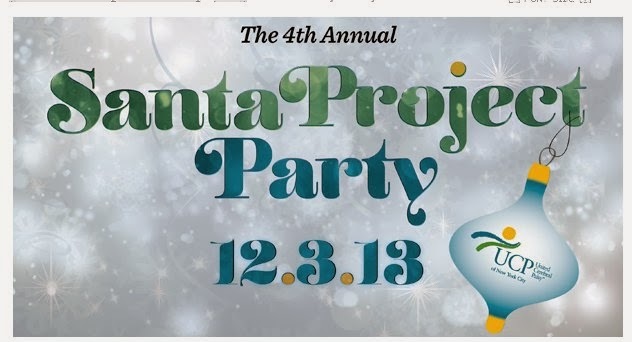 This marks the fourth consecutive year Ms. Barungi has Co-Hosted the Santa Project Party. Every year, this spectacular benefit attracts over 200 professionals including VIP luminaries from fashion, film, television, and Broadway. The event features a silent auction with a nice array of luxury goods and services for attendees to bid on. Spectacular photos by photographer extraordinaire Andrew Paterini are up and running on Facebook. Check them out by following the link below this post. UCP of NYC’s Santa Project began when committed supporters expressed a desire to do more during the holiday season. Beyond the core programs and services UCP of NYC delivers year round, proceeds from the Santa Project Party & Auction help fund special needs equipment requests and holiday gift cards for children with disabilities in UCP of NYC’s programs. Did you know that 92 cents of every dollar donation is being spent on UCP of NYC programs and services? Please donate. ▲ Tamsen Fadal, Emmy winning Anchor, PIX 11 News & Co-Host of the Santa Project Party and Auction. ▲ Scott Stanford, Co-Anchor PIX 11 News & Emmy Winning Sportscaster. Co-Chair of The 4th Annual UCP of NYC Santa Project Party and Auction. ▲ Isiah Whitlock Jr., star of “The Wire” and “Cedar Rapids” who has now joined the cast of the hit HBO series “Veep.” Co-Chair of The 4th Annual UCP of NYC Santa Project Party. ▲ Mike Woods, Meteorologist & Reporter, Fox 5’s “Good Day New York.” Past Co-Host of The 4th Annual UCP of NYC Santa Project Party. ▲ Ryan Asselta, Sports Anchor and Reporter for Fox 5 television in New York. ▲ Javier Gomez, Internationally acclaimed fine art photographer and Santa Project Committee Member. ▲ Lauren LoGiudice, Actress/writer, Santa Project Committee Member. ▲ Lori Sokol, Contributing Writer, The Huffington Post, Publisher, Work Life Matters Magazine, Board Chair Women’s eNews. YAY, the Facebook photos are up and running on The 4th Annual UCP of NYC Santa Project Party and Auction Facebook photo album. Enjoy these special, amazing photos from photographer extraordinaire Andrew Paterini on the special Facebook Santa Project Party and Auction photo collage album. “See What You Missed” video and “One to One” interviews will be here soon so please bookmark this post and visit often. Enjoy and stay tuned for more. About United Cerebral Palsy of New York City: United Cerebral Palsy of New York City (UCP of NYC) is one of America’s most established non-profits offering services, information, and support to children and adults with disabilities throughout New York City. UCP of NYC currently serves more than 14,000 individuals and family members through more than 75 comprehensive programs including health care, education, technology, residential, recreation, and rehabilitative services. The Mission of United Cerebral Palsy of New York City is to create opportunities for people with disabilities to lead independent and fulfilling lives.